EDITED BY CHARLES W. ELIOT , L.L.D. An older perspective on words in books. An MIT Museum article on Charles Eliot. Charles W. Eliot, president of Harvard, urged a merger but the MIT Corporation rejected the plan, dismissing Harvard as a "dead carcass." Eliot was a powerful link between MIT and Harvard. Born in 1834 in Boston, he graduated from Harvard in 1853 with an A.B. degree and three years later received his A.M. degree in analytical chemistry. 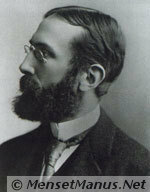 He joined the teaching staff at MIT in 1865 as professor of analytic chemistry. In 1868, Eliot was elected to the Harvard Board of Overseers by the alumni, and a year later he assumed Harvard's presidency. One department that did not prosper under Eliot's presidency was the Lawrence Scientific School and he sought to rectify this failure through a merger with MIT. Eliot's was not the first plan for a Tech/Harvard merger, nor would it be the last. The suggestion first arose in 1863 when Massachusetts' Governor proposed the idea, but William Barton Rogers, at that time struggling to find funding to get MIT off the ground, managed to convince the Governor otherwise. Eliot broached the subject with MIT's acting president John D. Runkle in 1870; however, Rogers remained staunchly opposed, as did the Institute's faculty and alumni/ae, and Eliot's plan went no further. Eliot raised the issue once more in 1897 with Institute president James Mason Crafts but no agreement was made because the two sides could not come to terms with administrative issues. A few years later, talk of a merger resurfaced yet again, this time prompted by MIT's president Henry S. Pritchett who saw union of the two schools as a way to strengthen MIT's graduate program, but alumni/ae and faculty from both schools fiercely objected. An agreement was entered into in 1914 between MIT and Harvard for cooperative instruction in civil, mechanical, electrical, sanitary, and mining engineering, as well as in metallurgy, during which time joint diplomas were awarded in these disciplines, but the Massachusetts Supreme Court struck down the agreement in 1917. This marked the end of proposals to merge MIT and Harvard, although the two schools have since undertaken a number of successful cooperative programs. Simply being praised is of no substantial help at all: it does not increase people's good fortune, nor does it make them live any longer. If temporary pleasure is all you want, you might as well take drugs. Yet many people invest much money and even deceive their friends to win status. This is quite stupid. Their status and fame do not really help much in this life and do nothing for future lives. There is no point in being happy if we are famous, or unhappy because people speak ill of us. I last touched this page on Saturday, 2007-11-17 at 05:08:34 UTC.